A modern maisonette of 44 sq. 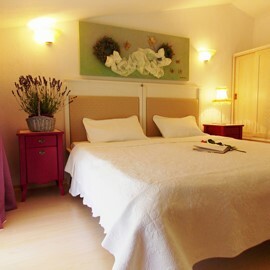 m, decorated with the romantic colors and fragrances of the wild lavender . As a little elf, lavender floods the air with its irresistible scent, waking up the senses but also the childhood memories to those staying in this accommodation. If you wish during your holidays to enjoy the Ancient Greek element through Fine Artwork, with authentic paintings, statues , anchor, amphoras and other exquisite artefacts, then you have only to choose and stay in this type of fully equipped modern “Antiquarian maisonette” of 44 sq. m, with 2 levels and private balcony. This advanced – artistic modern maisonette of 56 sq. m, on the 1st floor of the modern block, is characterized by highly visual artworks and an upgraded atmosphere. In it’s spa bath, relax and feel well, doing hydrotherapy, gaining a better body awareness, reducing your stress and extirpating tension from the body. 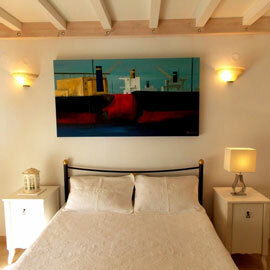 At the “Sailor’s Maisonette” (No 4), of 44 sq. m, the Greek navy style as well as the Sea element are intense. The sea, this miracle of Nature with its multifaceted beauty and color, is embedded in the lives of all of us. Come through the art of "tasting" the sea breeze and the experience of a "charming diving", choosing to stay in this modern maisonette, enjoying the most of your summer vacation. “Gardener’s Maisonette “ (No. 5), of 44 sq. m, on the 1st floor of modern block, is dedicated to the Greek countryside as well as to the people who respect and serve it. It is said that gardening is the secret of longevity, because those who deal with it are characterized by optimism and joy for life. Staying in this modern maisonette, through the decoration and the authentic artwork the visitor feels in harmony with nature, landscapes, water, plants, trees and flowers. 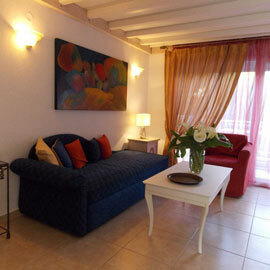 This advanced Μodern apartment with jacuzzi » No 6, is 49 sq. m and highly decorated with the intense of Sea element. That is independent , at the ground floor of the modern bloc, without stairs, just in front of a garden with palm trees, fountain and statues. Ideal for families with small children and for people with disabilities. At its Jacuzzi, relax and feel well, doing hydrotherapy, gaining a better body awareness, reducing your stress and extirpating tension from the body. 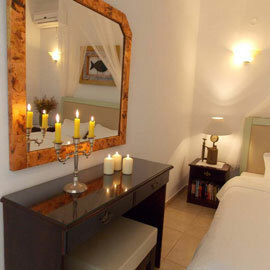 This advanced Μodern apartment with jacuzzi » No 7, is 49 sq. m and decorated with an intense of Greek antiquity, with authentic paintings of ancient themes, anchor, amphoras and other exquisite artefacts. Is next to the large garden with the lawn, garden furniture, barbecue, playground and the tree house. Ideal for families with small children and for people with disabilities. At its Jacuzzi, relax and feel well, doing hydrotherapy, gaining a better body awareness, reducing your stress and extirpating tension from the body. This advanced “Studio with jacuzzi » is 30 sq. 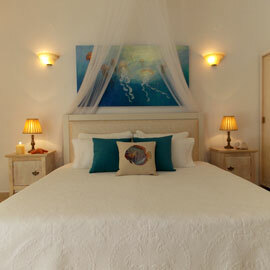 m and highly decorated with the intense of Sea element, with authentic seascapes, shells and other exquisite artefacts. 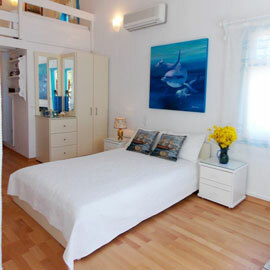 Come through the art of "tasting" the sea breeze and the experience of a "charming diving", choosing to stay in this modern studio, enjoying the most of your summer vacation. Ιn the “Sailing Maisonette” (No 1), of 28 sq. 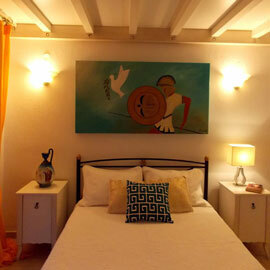 m, the Greek navy style is very intense and the sea elements enhance the decoration of this accommodation. The gorgeous seascape with dolphins, the pebbles, the sea-woods and various nautical miniatures, give you the feeling that you are sailing in the blue waters of the Aegean Sea, living a charming adventure. 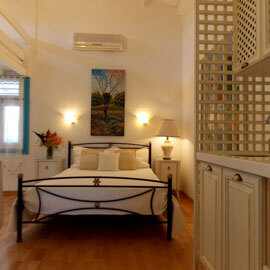 Τhe Traditional “Pine forest maisonette” is the favorite accommodation of those who expect quiet family holidays. Here the pine scent and the sound of bird song dominate. 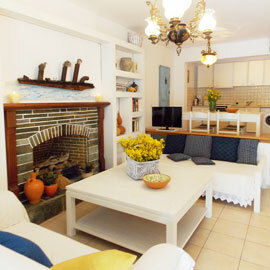 The infrastructure and its decoration, reminiscent of the old-fashioned houses of the Sporades Islands. This large and comfortable traditional apartment (house) of 64 sq. m, is an ideal destination for couples, families and friends who wish to enjoy their summer holidays, staying all together. From its lemon garden, unforgettable fragrances swell from the purple lilies, the gardens, the mint, the basil and the other various aromatic plants.